So the other day (other month, whatever) I was on my way to pick up my kids from preschool when I was surprised to see construction on a two-mile section of two-lane undivided 55 mph zone known locally as Tenney Mountain Highway. 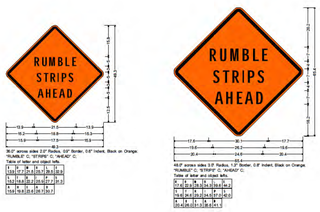 Surprised, that is, because I didn’t think it needed work, and they had just done some - you guessed it: rumble strips. But not just on the yellow line - that made perfect sense to me because it’s too busy and too short to pass anyone anyway, plus head-on at a combined 110mph=bad - no, they also put rumble strips immediately on the white lines on the sides; not 3 feet over, not a little over, but completely involving the white line. The result was nearby residents complaining that they were hearing the surprisingly loud sound of cars violating the rumble strip all hours of the day, dozens of times per hour. Apparently their voices were loud enough that within two months, the construction crews were now back, filling in the side strips (not the middle one). So I’m picking up my kids from day care and preschool one one fateful weekday afternoon, when I magically hit the traffic perfectly on my way there. They closed one whole lane of the 2-mile stretch and only allowed one direction at a time, pretty standard I guess. So now after pick-up I’ve got both kids in the car and I’m thinking, hey, my 4-year-old would love to see this equipment at work, so rather than go the back way home, I decided to go back through the construction. As I approach the merge onto this section just before the start of the construction, I can see that traffic is stopped. Perfect! They are just about to open up my direction for travel again, and I can surely merge in somewhere and make this wave of traffic. There’s only one car in front of me to merge, and it’s a bright red Mustang with a vanity plate. Sweet, this person will definitely jump in and I’ll just follow. One small opening goes by, plenty of room with a heavy right foot, but no. Another opening, maybe big enough? Nope. Okay, here we go... big opening, let’s go let’s go LET’S GO! GO! GOOOO!!!! Nope. Mustang waits. Traffic stops. Mustang pulls out but now the traffic director stops our direction because of the gap left by the Mustang. Now it’s 4:30 pm, and it’s August, and these guys on the crew are probably just trying to get this little debacle over with so they can go home and pound some beers. So they stop ALL TRAFFIC from BOTH directions to... who knows? Move some equipment around, I guess? Discuss the merits of Bud Light over Coors Light? I’m now sitting in my car, stopped still, fuming mad but trying to remain calm on the outside for the sake of both my hungry, tired kids in the back seat, and also hoping now is not the time some fragile part of my E46 cooling system decides to grenade, because it’s 87 degrees out (seriously) and I’m idling on the hot pavement, completely trapped. But how long can it be? It’s not like this is a busy metropolis, but this is a busy road for the area, and 4:30 is probably peak time in the summer. I mean, there’s a Wal-Mart AND a State Liquor Store just down the road. So how long could they, in good conscience, keep both lanes completely blocked, on a major artery of this rural town? We need our liquor and everyday low prices! 14 minutes. It was 14 minutes before we moved an inch. “Kitty” is the cat my wife and I have had since 2006 (he had a name but the kids called him kitty). He always had a voracious appetite, and long story short he developed diabetes this spring, didn’t respond to treatment, and died. My son didn’t really ask about where kitty went, and my wife and I didn’t really know what to say to him. We decided that when he asked, we’d just tell him the truth. He’s old enough to kind of understand, although this is the first living thing that he’s known that died. So after two months, he finally asks about Kitty, in the backseat of the car, in blazing heat, stuck in the worst traffic stop I have ever experienced in my local area in my entire life by a factor of 10 (it’s a rural area, traffic isn’t a thing). Crisis averted. I guess. But still I want to know who the hell thought that today’s distracted drivers could really stay between the lines 100% of the time, when the penalty for going just slightly over into the lovely 10' wide shoulder to give a 55mph logging oncoming logging truck a little extra room, for example, would be a violent vibration and an upset neighborhood.